As smoke was starting to billow from the Custom House a group of young men were being searched by an Auxiliary officer, while another kept them covered at gun point. The men being searched belonged to the elite ASU of the Dublin Brigade. The Auxiliary searcher had no idea of who the men were, only that he knew they were rebels. Walking away from the group a neatly-dressed, broad-shouldered and handsome young man, having spent some time telling the Auxiliaries he was in the Custom House on legit business, was let go free. Mick Dunne, Section Commander of Number 1 Coy ASU, strolled away from the scene. Within 2 years he would be dead, in one of the most horrific incidents of the Civil War, at the hands of his own countrymen. The first child of John, an Electrical Fitter and Catherine Dunne, Michael was born in Dublin South city in 1897. The family were living in Great Britain Street (now Parnell Street) in 1901. There seems to have been only one other child, Elizabeth, who was three years younger than Michael. After leaving school Mick took an apprenticeship as a Fitter and worked for the Tramway company in Ballsbridge. 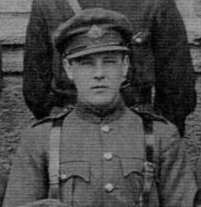 Mick Dunne joined the IRA in 1918 & served with the 1st Battalion. On formation of the Active Service Unit in December 1920 he was one of the original members in Number 1 Coy and was picked as Section Commander of that unit (Section Commander was the same as Lieutenant in a regular army, Section Leader being an NCO rank). The Active Service Unit’s role was to harass the British forces on a daily basis. This was normally done by ambush – a hit & run tactic was used as the ASU did not have the men nor the ammunition to engage the British for prolonged periods. Their favourite weapon was the home-made grenade. An ambush would be set up and grenades thrown at the British army or Auxiliaries. As the ASU escaped they would return fire using their hand guns if needed. Mick took part in plenty of these actions and is mentioned in several Witness Statements including one which goes into detail on an ambush in North Frederick Street. The Active Service Unit was broken into 4 Coys (Companies) numbered One, Two, Three & Four. The Coys operated and were armed by their own Battalions. All four sections were involved in the attack on the Custom House on May 25th 1921. The ASU numbered fifty men, of these fifty men between twenty five and thirty were captured at the Custom House fire. The solution to rebuild the unit was to merge the Active Service Unit with The Squad of IRA GHQ (The Squad had lost around eight men out of twenty one at the Custom House). The new unit was called the Guard and they operated on the same manor as the ASU up till the truce in July 1921. 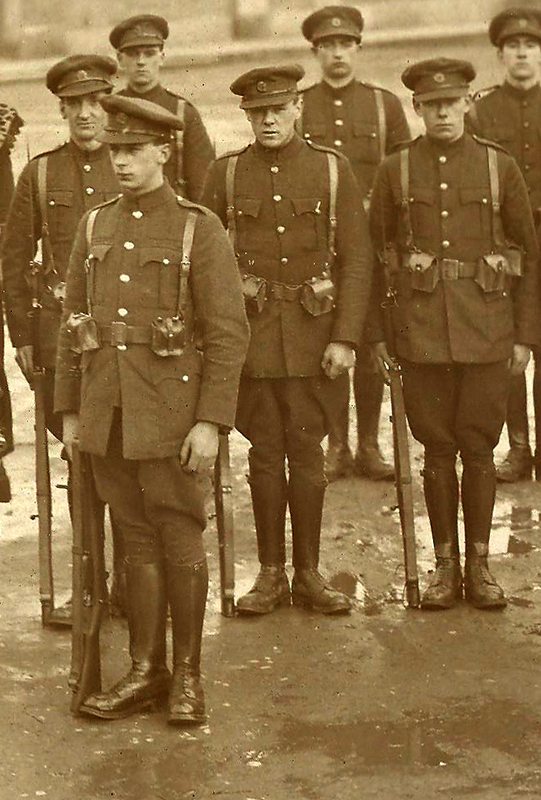 The Guard was then formed into the first unit of the new Irish (National) Army and again got renamed as The Dublin Guards. The Dublin Guard are famous for taking over Beggars Bush Barracks, the first handed over by the British Government to the new Free State. Mick can be seen in the front row of the group picture (Army number 14401). One thing that stands out in the picture is most of the men don’t have ranks, so we are to presume that they are privates, even the likes of Mick Dunne who was an IRA officer. Most of the men in the Bush takeover were soon commissioned as the new army grew. By the summer Mick was a commissioned officer at the rank of Captain. As the Civil War got into full swing, Mick Dunne was part of the Kerry offensive. The Army census of November 1922 shows Captain Dunne age 25 stationed in Abbeyfeale, Co Kerry; he lists his Mother as next of kin with a home address for himself & his Mother of 12 Fitzgibbon Street, Dublin. On the night of March 6, 1923, the Dublin Guards got a letter telling them there was an arms dump in Knocknagoshel. They followed up the lead but the dump was trap mined; in other words it had a bomb planted in it to be set off by a trigger wire. Mick Dunne along with Captain Ned Stapleton, Lieutenant Patrick O’Connor, Private Laurence O’Connor and Private Michael Galvin were all killed instantly; Private Joseph O’Brien lost his legs & had his eyesight damaged from the explosion. Mick Dunne’s death was registered by Captain Patrick Lawson (formerly of Collins’ Squad). Paddy Lawson stated he was with Mick Dunne at the time of his death. Captain Michael Dunne is buried in the Free State Army plot in Glasnevin. Today, just a faded inscription marks his existence and date of death. His Mother Catherine Dunne was awarded a small pension of £1 per week by the Army as she had been dependent on his income. Mrs Dunne did not recover from the shock of her son’s death as she passed away herself in the hospice in Harold’s Cross on 16 December 1924. She was survived by her only other child, daughter Elizabeth. This information is so interesting. Anything on Michael Flanagan my grandfather. Hi Im wondering could you give me any more info on Captain Edward Stapleton and also would you have any ino on a Edward Valentine..